Here are some of the reasons why I love Uruguay South America. The People of Uruguay are Honest! I have found a majority of these countries to be somewhat dishonest. Now, don’t get me wrong. I love Latin America and have made many friends there but I just seem to find that the culture for many of the countries was somwhat dishonest. That being said I found Honesty Alive and well in Uruguay. Here are just a few examples and thoughts about this. In my travelling experience in Latin America, I found the Taxi drivers were always trying to take advantage of me. Either they were overcharging or taking the long way around to get to my destination, not realizing I was familiar with the route that they should have been driving. This however was not the case in Uruguay. 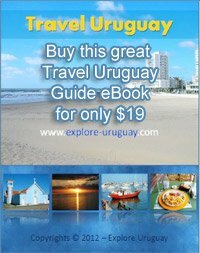 I travelled extensively in Uruguay from Montevideo to Punta del Este. I spend time in Piriapolis, La Paloma, Durazano, Salto as well a s Colonia Uruguay and other cities in Uruguay. I especially enjoyed Punta Del Diablo, but I think that’s a story I will save for another time. The Taxi drivers I encountered as well as the store owners were honest as were the people of Uruguay that I encountered. Another thing that is very different in Uruguay compared to other countries in Latin America is that Uruguay is your safe. Really, compared to other places that I Traveled to including Columbia and Ecuador which could be dangerous if you were an unknowing tourist without a good grasp of the culture and where you were or were going. In my experience, there really seems to be a lack of safety and you always see armed guards with guns and sometimes even machine guns. I also noticed plenty of barred windows and gated properties. I don’t think anyone would argue that there is a there is fairly serious crime throughout the rest of Latin America. Now, that being said, let me give you my take on Uruguay and here’s an example. I can still remember a Uruguayan telling me that for every police officer I saw, there 3 undercover police officers. They were in shopping centers, on the streets and even in the grocery stores. You would never notice them, they blended into the crowds and I never felt a Police presence and I always felt safe. Recently I read that according to the global peace index Uruguay is the 24th safest country in the world compare that the United States which is rated 85th. For anyone reading this and wondering, I have to tell you. I felt safe. I didn’t have to be guarded and worry about something bad happening to me. I wasn’t always watching my back and nervously holding onto my wallet. Very much a middle class country like Canada USA and Europe. The wealth seems to be much more evenly divided. There isn’t such a huge difference between the classes. You don’t see people in the streets. Sure, there is some poverty but it won’t be part of your daily life and such a nice place to live. It’s a a special place so different from other places. Often you will hear that Punta del Este is referred to as the Monte Carlo or Switzerland of South America, but without the Mountains. Great offshore banking without the mountains. Check out Piriapolis Uruguay. Another reason is corruption which comes in all forms, from minor to major. lots of traffic police who extract bribes. I didn’t find that while visiting Uruguay. The police seem to be honest and respectful to both citizens and tourists. Building your Own homes is seldom a problem in Uruguay. They seem to welcome foreign investors with open arms and encourage you to invest and build. Uruguay is a very honest and a Non Corrupt Country. A great place to live and spend your money and invest in Real estate. Safety and Honesty, low poverty and things that are important to Families. Its an unusual place where it is an exception to the rule. It has happened because it has an even distribution of wealth. People are content and a middle class country. My overall experiences were fantastic! Uruguay has fantastic infrastructure. Four lane highways with lighting not dirt roads or pot holes. Not many black outs or even brown outs. Electricity and high speed internet is exceptional. Having a nice infrastructure was and is definitely important to me and is great in Uruguay. This is key when I was considering investing my money. With a History of stability both economically and politically. Uruguayans for the most part don’t like big changes in government and politics. They are definitely pro business! From my experience investors get scared and even if buying for personal use you’re looking for a political and Economic stability and The Uruguay Economy is as stable as they come. Here is something else I can really appreciate. Real Estate in Uruguay is Free hold property. You can pass it onto your heirs. This beautiful Country in the southern hemisphere really is in a special corner of the world. You always get to miss the winters. No I do not want to sell you anything. I think I am right about this because Uruguay is known as the jet set location of the rich and famous of South America. If you are wondering about getting there, I should also mention that the newly built Montevideo Airport is not only High Tech but also an architectural Marvel. I will try to send you guys some pictures soon. Oh, and one more thing I almost forgot to mention, there is also great airport in Punta del Este so if you want to get straight into the heart of tourism in Uruguay, you can fly direct. Ok - I know this was long, but I really do get excited when I think about all the great experiences I have had while discovering Uruguay, exploring the culture and making great new friends in Uruguay. PS: Great site Guys! Keep up the good work. I love reading your Blog Updates and will try to send some pictures your way soon! I guess you learn something new everyday. I didn't realize Uruguay was rated so high on the Peace index. I have been hearing more and more good things about this country. Hopefully someday I will get to visit Uruguay.